Tropical Storm Harvey, which has dumped more than 51 inches of rain over parts of Texas and flooded hundreds of thousands of homes, intensified this afternoon over the Gulf of Mexico as it continued to move to the North-Northeast. As of the 4 PM CDT advisory from the National Hurricane Center, Harvey’s minimum central pressure had dropped to 994 mb even as its maximum sustained winds increased to 50 mph. This made Harvey a still rather weak tropical storm is it continued to lash sections of Eastern Texas and Louisiana with winds and rains. Now a 5-day long event since threatening the Texas Coast as a category 4 storm on Thursday, Harvey has produced the worst flooding in Texas state history. In Houston, dams designed to contain a 1,000 year flood are overflowing — increasing already catastrophic flooding throughout the beleaguered city. 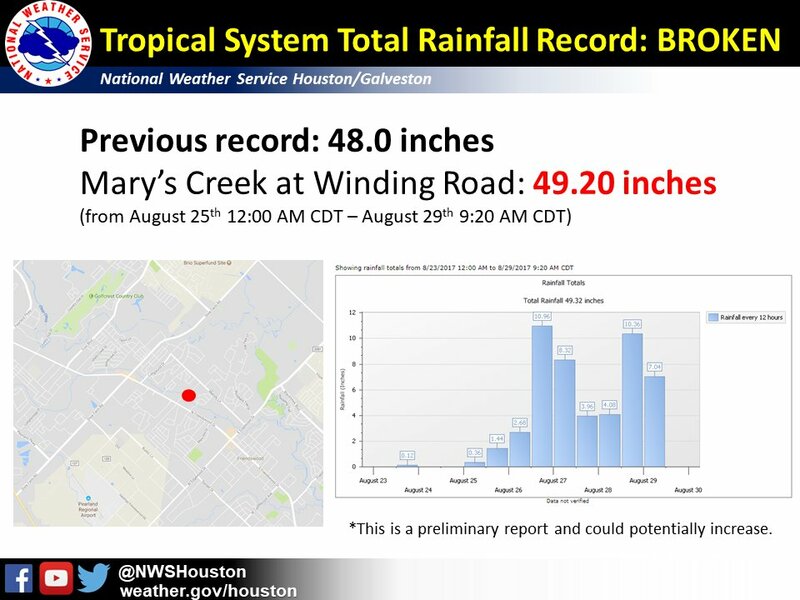 Very heavy rains have fallen over Houston since Saturday. But during the early afternoon hours rains had lightened over the city as the heaviest squalls shifted further east over Beaumont. Recent weather radar imagery from the National Weather Service, however, has shown more intense rain bands again back-filling over Eastern Houston in coordination with Harvey’s recent re-intensification. Tonight, Harvey is expected to track inland before being pulled northward by a trough and finally leaving Southeastern Texas behind. But not before giving the region one last lashing over the next 12-24 hours or so while dumping another 6-12 inches of rain. Record 49.20, which you’d posted earlier. Now up to 51.88 as of 3.40pm CDT. Record-breaking high temperatures in California today, and big fires further north as well. The hits just keep on coming! 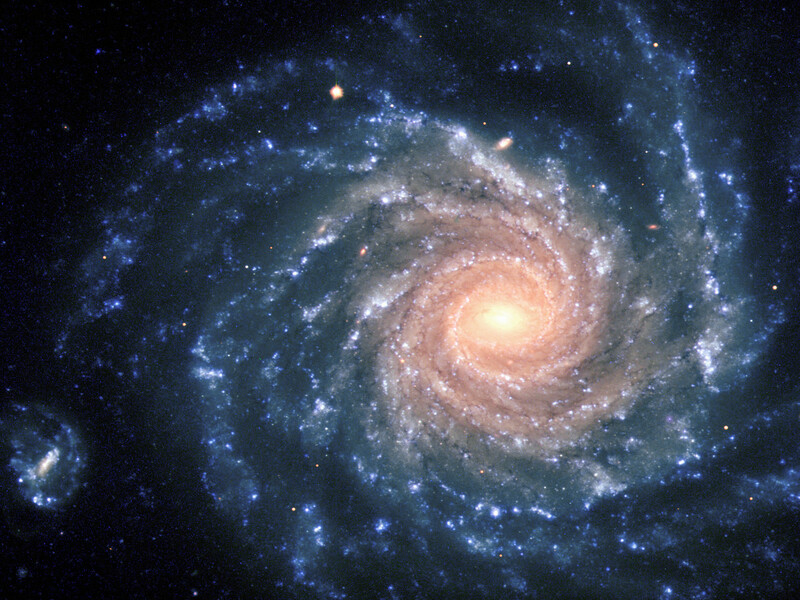 Is it forming a new eye? Not an enclosed one. The center is still away from strongest convection. However, there is a worrying jog to the east in recent frames. If that keeps happening, watch out Louisiana. Not yet. Will see. Right now, the models bring it on shore near the Louisiana border. Not too much change. The jog has a SE component. And it’s over some very warm waters. So if this does keep up, it’s something we’ll need an update on. “Harvey was taking aim at Texas again Tuesday, forecast to make landfall later somewhere along the border with Louisiana after swamping the Houston area with record rainfall and deadly flooding. 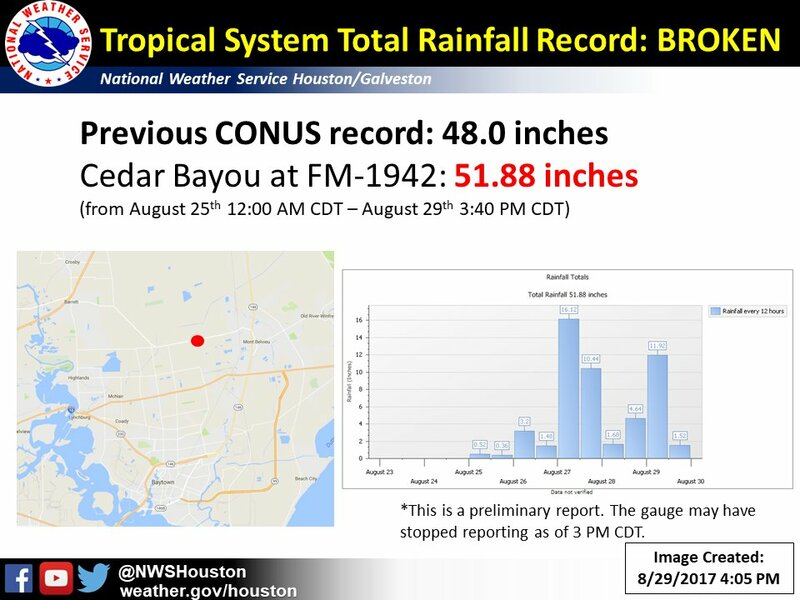 The storm literally became historic on Tuesday, when the record for rainfall from a tropical cyclone in the continental United States was smashed at 51.88 inches in Mont Belvieu, 35 miles east of Houston, the National Weather Service reported…. Harvey, now a tropical storm with maximum winds of about 50 mph, was about 30 miles east-southeast of Galveston, Texas, at 5 p.m. ET Tuesday and was moving northeast at about 6 mph. It is expected to remain offshore in the Gulf of Mexico before making landfall again in southeast Texas, on Wednesday. Bands of heavy rain are expected to persist over the next several days, with parts of Texas and Louisiana facing record rainfall through at least the Labor Day weekend, forecasters say…. As it makes landfall again, Harvey was expected to pack winds up to 45 mph and drench the upper Texas coast and southwestern Louisiana with 6 to 12 inches of rain before heading deeper inland, the National Weather Service warned. Forecasters said final localized rain totals up to 50 inches were possible in Texas by later this week. “The whole problem with Harvey the entire time is that it has basically been stationary, and it continues to be fed by moisture coming off the ocean,” said Danielle Banks, a meteorologist for The Weather Channel. Parts of southwest Louisiana have already recorded more than a foot of rain from Harvey’s outer bands, and 5 inches or more are possible through Thursday, said the National Weather Service, which projected tides up to 2 feet above normal along the coast west of the Mississippi River. A coastal flood advisory is in effect. About 500 people were evacuated from the Gulf Coast near the Texas-Louisiana border, where Harvey is expected to make landfall around midday Wednesday, Edwards said. More than 250 were already bunking in Louisiana shelters, more than a dozen government offices were closed, and 671 members of the Louisiana National Guard were “working on Harvey operations,” he said. In New Orleans, Mayor Mitch Landrieu marked the 12th anniversary of Hurricane Katrina, which devastated his city — and sparked an exodus to residents to new lives in Houston. Got it. Thanks for that assessment. Today Donald Trump visited Texas. He had no words of comfort for people forced from their homes, or for those who lost family members — instead he bragged about his crowd size. The overheated waters of the Gulf of Mexico following the hottest month ever measured on earth made Harvey into a monster storm. Trump is refusing to tell the truth and name climate change as a key culprit in creating this disaster. If we want to prevent more disasters like this one, we need to call it what it is. Every leader who wants to defend vulnerable communities threatened by stronger storms, and who understands climate science should condemn Trump’s climate silence. Can you send a message to your Members of Congress asking them to connect the dots between Harvey and climate change and condemn Trump’s climate denial? Click here to send a message to your Members of Congress about standing up for the truth and condemning Trump’s climate denial. This is exactly the moment to be talking about climate change. The historic destruction Harvey has brought to the Gulf is the product of higher sea levels and warmer waters caused by climate change. If our politicians can’t call this what it is and get serious about climate action, they are not prepared to protect people from the next storm. The people who will pay the highest price from inaction are often poor, people of color, or from other vulnerable communities. People living next to toxic refineries and chemical plants in Houston are at elevated risk of contamination from spills and other disasters as you read this. Trump is only making the problem worse. Just last week he disbanded his climate advisory group and revoked requirements that new federal infrastructure take sea level rise into account. That’s on top of exiting the Paris Agreement, approving the Dakota Access Pipeline, and appointing climate deniers throughout his administration. This is no time for Trump’s egomania and climate denial. Tell your members of Congress to condemn him, and speak out for the truth. Thank you for speaking out. We will continue to push, together. All of Donald Trump’s billions. “…yes it really does matter that Melania Trump headed out to a disaster zone in five-inch stiletto heels. Even if she is famous for wearing them nearly all the time, and even if she was planning to change on the plane even before her footwear became the latest internet meme. We live in a world of visual communication, and this is especially true of Melania Trump who has not been very vocal about much of anything during her time as a candidate’s wife and then first lady. 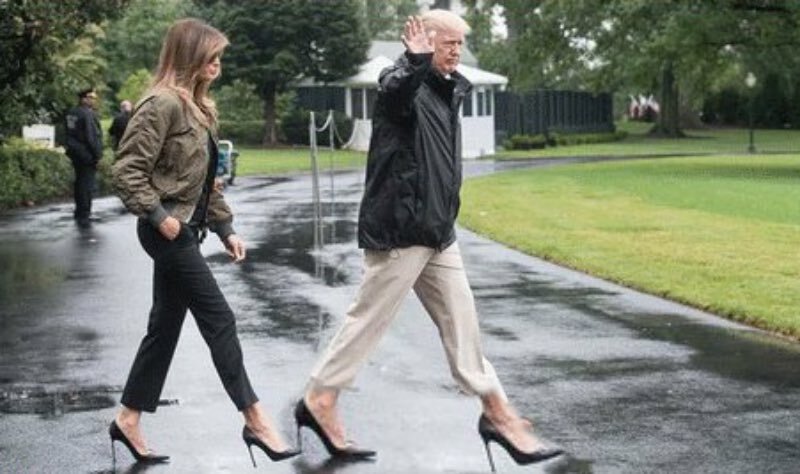 Yes, these are serious times, especially in Texas, and no, no one should be obsessing about what the first lady has on her feet. That’s precisely the point. By taking the time to carefully put together not one but two made-for-papparazzi looks, the first reminiscent of Top Gun, the second of preppies everywhere, Melania Trump pulled the focus of the visit away from where it belonged. Many commenters claimed the shoes were proof that the president and first lady were merely seeking a photo op and not a chance to be helpful. 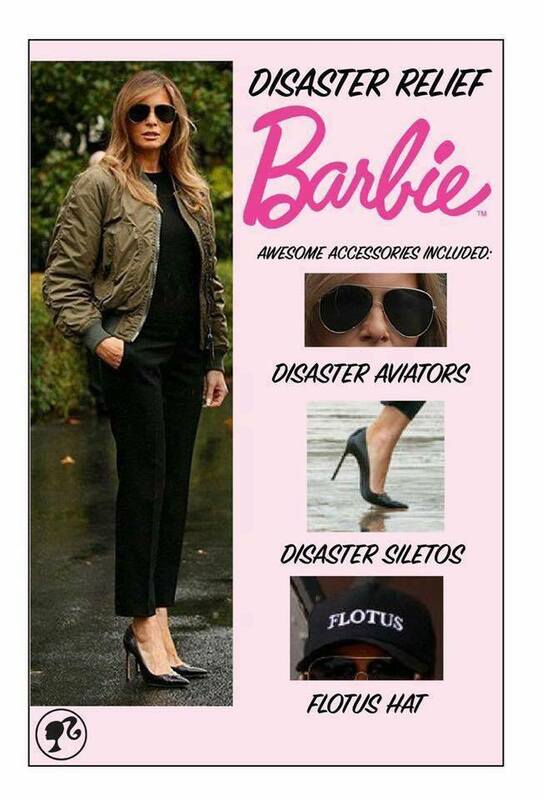 I don’t know if that’s true, but her clothing choices sure made it look that way.” – Inc.
“But what kind of message does a fly-in visit from a First Lady in sky-high stilettos send to those suffering the enormous hardship, the devastation of this natural disaster? 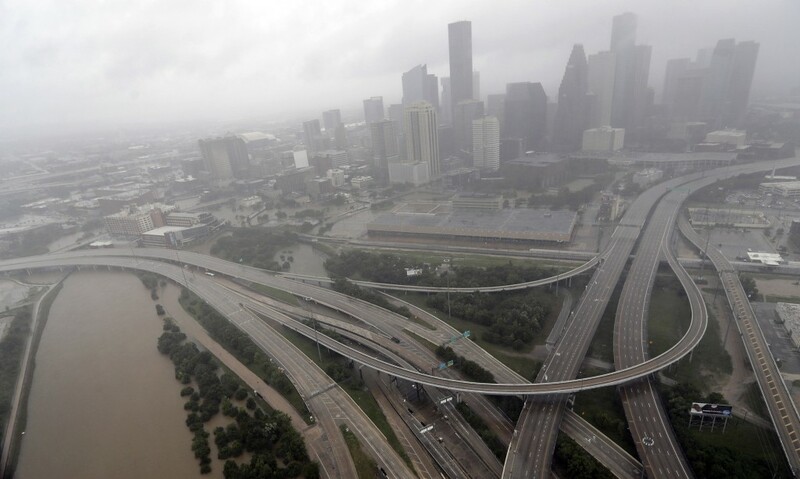 Highways around downtown Houston are empty as floodwaters from Tropical Storm Harvey overflow from the bayous around the city, Aug. 29, 2017. Water from the Addicks Reservoir flows into neighborhoods. Homes are flooded, even children’s playgrounds are in deep water. ^Metaphor for the earth and all inhabitants. Looks like some flooded deltas in Africa. Wow. Basically an area the size of the state of New Jersey. A lot of these areas will be abandoned ala parts of New Orleans. Today is the 12th anniversary of the breaking of the levees. Honestly, many of these areas should be abandoned. It would be insane to remain at a location where events of this sort will continue to occur with increasing frequency. it’s the sad reality in which we find ourselves. 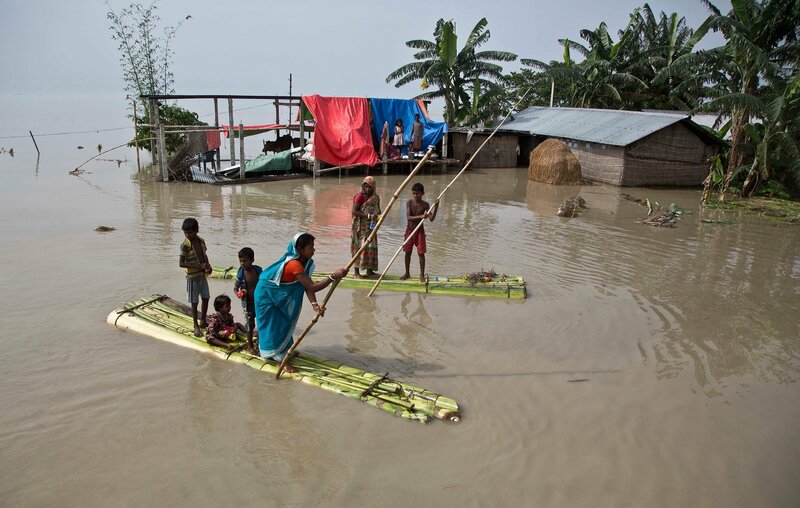 “More than 1,000 people have died in floods across South Asia this summer, and as sheets of incessant rain pummeled the vast region on Tuesday, worries grew that the death toll would rise along with the floodwaters. Maybe for your outboard motor? Thanks, Robert! I needed that laugh. This is grim stuff. Thank you Robert for your continuing coverage of this. I noted that temperatures there have been 20 degrees Fahrenheit lower than normal this time of year which is a relief to those on the ground but is a piece of the puzzle linking to climate change as it indicates changes in the jet stream. Can you explain to followers why that might be the case along with the issue of stalled fronts? I know that might be a.complete post but an outline for now would be appreciated. For a brief explanation, if you look at the work of Dr Jennifer Francis, you’ll find that warming in the Arctic results in more large ridges and troughs in the Jet Stream. This also causes more fixed and persistent weather patterns. In such cases, things tend to linger for longer. Storms and droughts tend to stall over the same areas for longer periods. This year, a large trough in the East and two related blocking highs — one in the west and one in the East — associated with high amplitude Jet Stream waves created a pocket in which Harvey could stall for a longer time than usual. This was just one of the climate change based factors related to Harvey. More on this later. Good stuff ^there. Interview with Trenberth. Trend in U.S. mainstream media is changing, though. I was wondering about what RS would say about Trenberth’s critique of the meteorologist’s implication of stuck weather patterns, but I believe RS answered the question in his Aug. 30 post (i.e., that a climate change induced stuck weather pattern did play a role in the severity). My opinion is yes, absolutely. The Harvey stall was an attribute of the various blocking patterns at play. These blocking patterns, in turn, were contributed to by polar warming’s influence on the Jet Stream. There is no consensus right now on this issue. My opinion and observations support that line of evidence, though. I will probably be attacked and/or taken out of context because of this view. I don’t really care. I’ve got to call it as I see it. Vancouver B C 17 degrees and clear skies . Rain in B C has been so scarce , Best thoughts to all species affected by these events that will become more and more frequent . Its been hard to watch this …..we have smoke in the Alberni Valley again . Vancouver Isl. Thanks Eleggua , For all your efforts on your posts. You’re welcome. Thank you for what you’re doing! It’s painful to observe; spent a lot of time up there and love it dearly. “….For Texas, the measure of dysfunction was a failure to coordinate evacuation orders. A climate-change denier, Governor Greg Abbott nevertheless urged everyone to get out of harm’s way. But Houston Mayor Sylvester Turner, remembering the catastrophic, sometimes lethal, traffic jams associated with past evacuation efforts, said not so fast. Rockport Mayor Pro Tem Patrick Rios told constituents who failed to leave town to write their names on their bodies with Sharpie pens so coroners would be able to identify their corpses. “As the Dutch made clear to Times reporter Michael Kimmelman, their revolution in water management isn’t just a burden shouldered grudgingly by a low-lying nation. It’s an exciting challenge, a source of pride—and a source of money. Exportable water management ideas are to the Netherlands as cheese and wine are to the French, Kimmelman quipped. The Netherlands is pioneering—and, where possible, marketing—insights, attitudes, and technologies in demand around the world as weather worsens and seas rise. There’s an irony here. A hundred years ago, when the New Orleans pumping system was considered an engineering marvel, it was the Dutch who came to us in search of guidance. Their version of Katrina was the horrific 1953 inundation that made water management a national purpose of existential urgency. They turned disaster into a much more trenchant learning experience than we have. We could be part of that engineering and commercial juggernaut. In a sense we are—but so far, our role is that of the coal-mine canary. We are a city that should be augmenting public safety by implementing the new water-management paradigm. The Dutch build purposely leaky levees and marvelous parks alongside massive flood gates attuned to the rhythm of the clouds and seas. We don’t put the cultural or monetary investment into flood management. To anyone that’s encountered the normal monsoon deluge, that figure is mindblowing. For a few minutes in Houston rain rates were nearly 12 inches/hr. Nice piece at the Guardian. Michael Mann, Stefan Rahmstorf, “a general slowdown of atmospheric summer circulation in the mid-latitudes as a result of strong warming in the Arctic”, “simulations have indicated that similarly rapid increases in storm speeds will be 10 to 20 times more likely to occur by 2100” – just like reading the Scribbler! 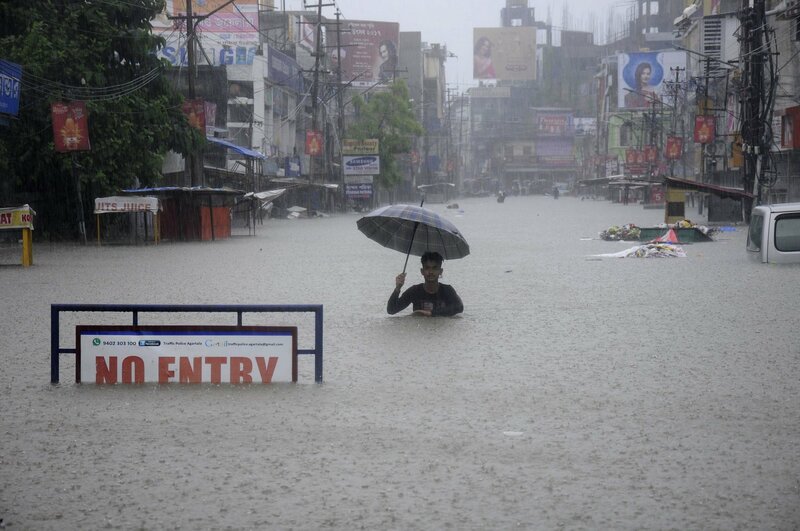 Not just the Gulf and South Asia currently getting drenched and flooded. “e should also spare a thought for the floods that have each taken more than a thousand lives in Sierra Leone and South Asia. Satellite imagery shows a mudslide triggered by rains that wiped out part of a neighborhood in Freetown, Sierra Leone. This what is called “Duff’s ditch”. It is a serious lesson in planning ahead. When the waters recede, one can hope such things are discussed. It is a 47 km (29 mi) long channel which, during flood periods, takes part of the Red River’s flow around the city of Winnipeg, Manitoba to the east and discharges it back into the Red River below the dam at Lockport. It can carry floodwater at a rate of up to 140,000 cubic feet per second (4,000 m3/s), expanded in the 2000s from its original channel capacity of 90,000 cubic feet per second (2,500 m3/s). It was built partly in response to the disastrous 1950 Red River flood. 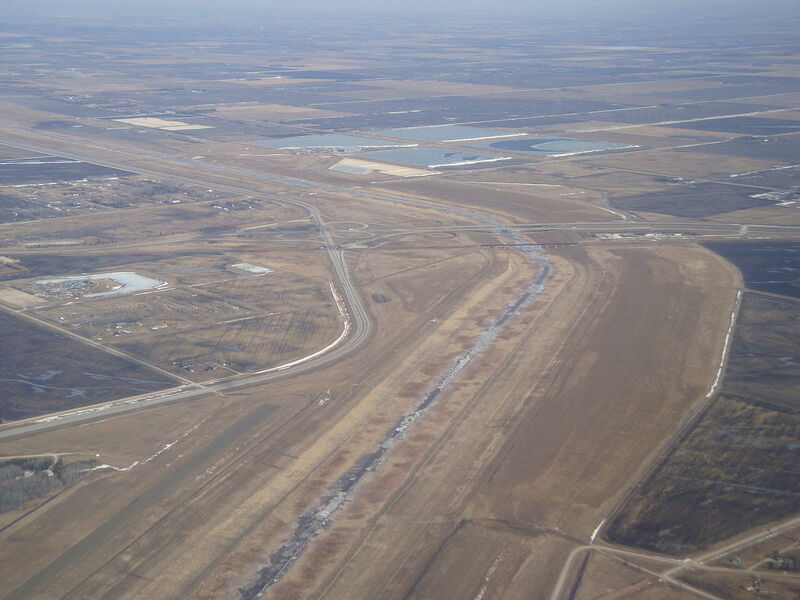 The Floodway was pejoratively nicknamed “Duff’s Ditch” by opponents of its construction, after Premier Duff Roblin, whose Progressive Conservative government initiated the project. It was completed in time and under budget. Subsequent events have vindicated the plan. Since its completion in 1968, the Floodway has prevented over $40 billion (CAD) in cumulative flood damage. And in order to save that 40 billion dollars what did it cost? The total cost at the time was $63 million (CAD), equivalent to approximately $505 million today. Infrared image of Hurricane Harvey just prior to making landfall along the Texas coast. 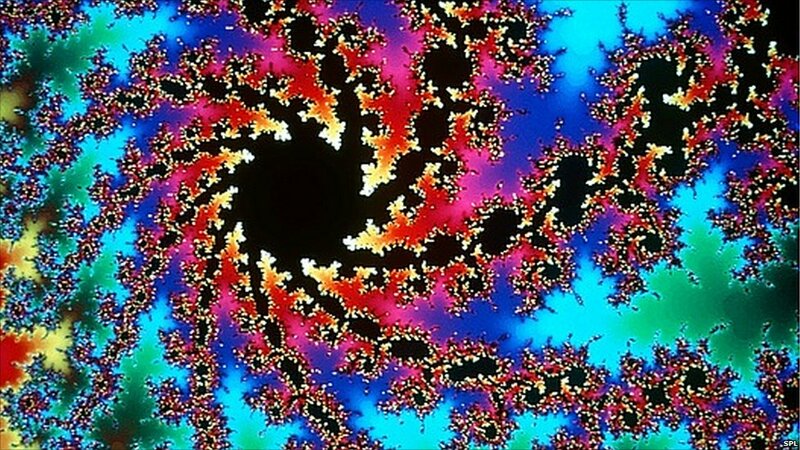 In his seminal 1982 work The Fractal Geometry of Nature, Mandelbrot argued that seemingly random patterns could in fact be the same infinitely repeated shape. I’ve avoided sending along the barrage of climate related articles I read on – high temperature records (particularly in the Arctic), Greenland and Antarctic ice melt, sea level rise, declining ocean health, disrupted jet stream flows, floods, forest fires (& in Greenland a peat fire where the tundra has defrosted and dried) and of course human fatalities and refugees. Americans tend not to worry about the disasters happening on other parts of the globe. But, now we have our very own catastrophe. Here in Oregon and up in British Columbia the air is thick with smoke and dangerous air quality. And you all know about TX. I’m not being alarmist – really more of a realist. This is just the beginning. The amount of CO2 now in the atmosphere (not counting the amounts we continue pumping out daily) will cause the global temperature to continue rising beyond 1.5C and beyond 2.0C within the next 10 to 50 years. What a world we are leaving for the coming generations. What will they have to say about us and the lack of leadership our governments and corporations have shown? Billions in disaster relief, but no hint of ceasing our dependence on fossil fuels. It is what it is , instead of being a radical and getting to the root of the problem, literally 100s of Billions will be spent on relief and rebuilding ,as certain people will make huge profits off this . Ienstiens definition of insanity on a massive scale . Ive known co2 to be a greenhouse gas since 1986 ish , and watched the Canadian gov, give grant after grant to these corporate giants , this makes them guilty of intergovernmental crimes against nature and the future of so much , so many . Radical = “of the root”. That’s the etymology of the word radical. It’s not “wild and crazy”. Radical solutions for radical problems: that’s the near future. Radicals will be looked to for solutions, not demonized for “extremism” and other nonsense. CBC News reports on Giant Craters in Canada – seems not too dissimilar to the news from Siberia earlier. Melting permafrost releasing carbon dioxide to atmosphere, contributing to greenhouse effect. Opinion piece by the managing editor of the Houston Chronicle. “I’ve covered the news in Houston for 3½ years and have already seen two devastating floods and now what is being described as a one-in-800-years flood brought on by Hurricane Harvey. That suggests to me that something is happening here that’s way bigger than the largely made-up tiff between Texas Gov. Greg Abbott (R) and Houston Mayor Sylvester Turner (D) about whether Houston should have been evacuated before Harvey dumped trillions of gallons of rain on the nation’s fourth-largest city. There’s no denying Texas is politically polarized, with all its major cities liberal and Democratic, and the rest of the state, and all its statewide elected officials, conservative and Republican. So there’s no end of discord and rancor if one wants to find reasons for blame and finger-pointing. 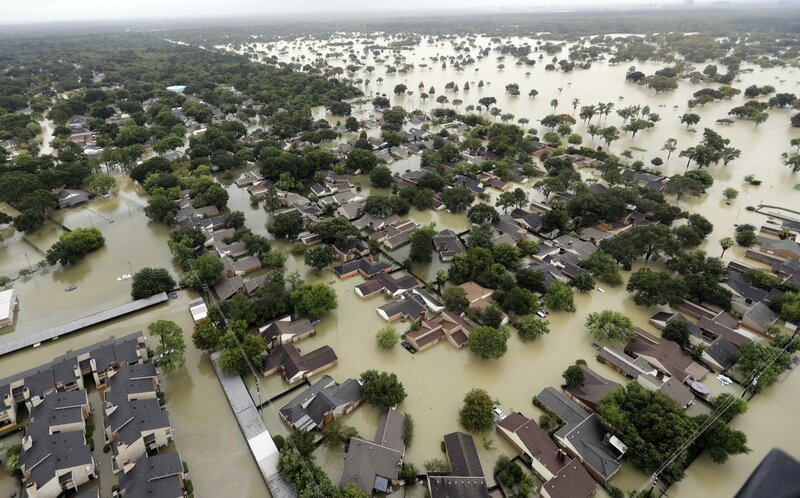 Houston, meanwhile, can be its own worst enemy when it comes to flood control. A big part of its freewheeling, entrepreneurial identity is its lack of zoning, which has produced more than 600 square miles of subdivisions, strip malls and concrete prairie. It’s not hard to wonder whether this vast expanse of what was once coastal plain was really the best place to build a major city. But anyone who has lived through four straight days of torrential rain that may surpass 50 inches knows perfectly well that no zoning code, infrastructure improvements or flood control regulations could have done anything to deal with this much water inundating a major metropolitan area this quickly. And it is an unbelievable amount of water. Not wanting to risk my car on Sunday morning, I started toward our newsroom on foot and found myself waist-deep two blocks from my home. On Monday I ventured a mile north to Buffalo Bayou, a bucolic urban park remade thanks to $25 million from a leading local philanthropist who once worked for Enron. The park was gone, its meandering bayou now a roiling, fast-moving river that had engulfed parkways on both sides, flooded a television station and badly damaged much of the city’s theater district. On a stretch of Kirby Drive in River Oaks, Houston’s toniest neighborhood, the water was chest-deep, lapping up onto mansion lawns. What they’re talking about, whether they know it or not, or care to acknowledge it or not, is global warming. The planet is getting warmer, ocean temperatures are rising, the polar ice caps are melting, and all of the incontrovertible science of climate change is that more extreme-weather events are an inevitable consequence. Tom Friedman in his new book calls climate change a “black elephant” — a combination of the unforeseen “black swan” event with enormous consequences and the “elephant in the room” no one can see. There’s really no other way to make sense of what’s happening in Houston. The black elephant is here in America, just as it’s in Africa and the Middle East and Antarctica, whether we want to see it or not. Just acknowledging that will help Houston recover once the rain finally stops, making the political blame game even more futile than it has already become in American politics. 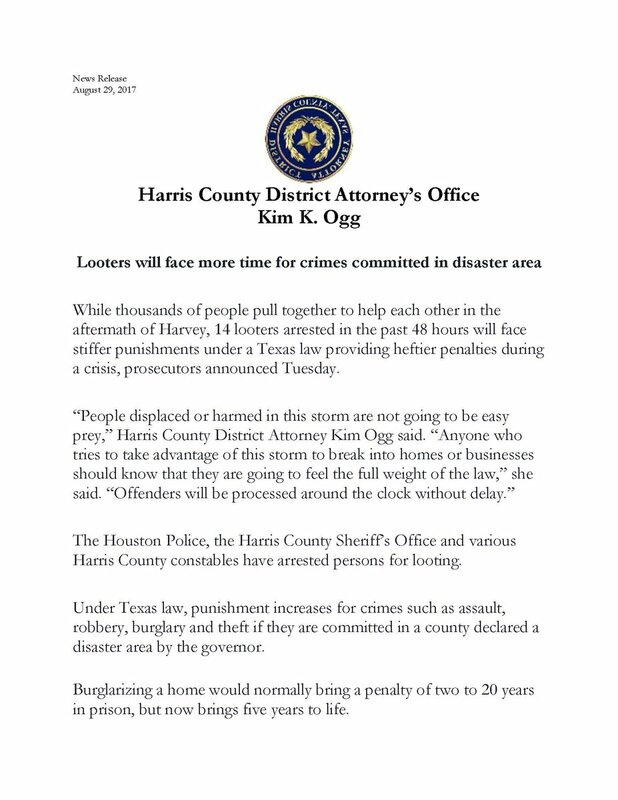 For now, Abbott and Turner are working tirelessly and cooperatively to help the thousands and thousands of people trapped by the worst floods in Houston’s history. And whenever it’s over, Houston should use Harvey to jump-start its transition from the country’s epicenter for oil and gas to a world capital of alternative energies. If the city can turn this devastating tragedy into an existential moment of reinvention after the storm, then a decade from now we may argue that it was worth it. As for the nation, Americans need to understand what leading scientists have concluded even if many of our political leaders pretend it’s not true — we’ve just about blown through the Holocene epoch, when Earth emerged from the last ice age and became more comfortable for human life. Some climatologists have started to call our current age the Anthropocene, in which conditions on the planet have been dramatically altered by man. We have to take responsibility for what we’ve done, and take charge of our future. 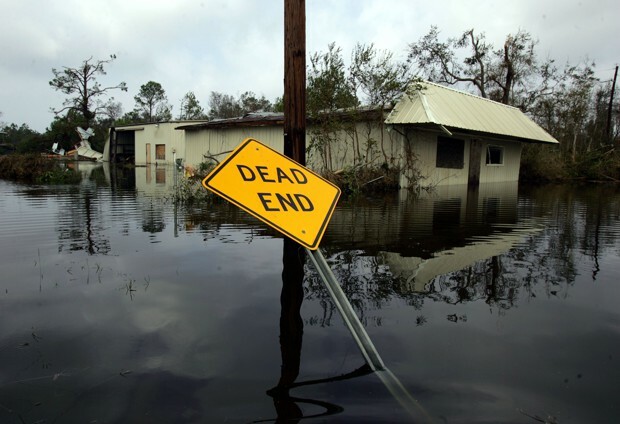 Here is what has not happened: There has been little or no effort at zoning protection to keep development clear of floodplains; little or no offshore and onshore infrastructure for flood protection; no discernible heed paid to the scientific evidence and indeed the growing practical experience of catastrophic flood risks; and of course, relentless, pervasive climate change denial, the mother’s milk of Texas politics. So, here’s the deal. Those of us elsewhere in the US also suffering from flooding and other disasters from warming temperatures, rising sea levels, and more intense storms (such as New Yorkers who are still rebuilding from 2012 Hurricane Sandy) want truth from Texas politicians and the oil industry. We are bearing the costs of your lies. We are tired of it. More importantly, we are in pain and solidarity with the good people of Houston who are losing lives, homes, and livelihoods because of your lies. Yay! Tell it like it is and don’t stop ’til they get enough to figure out truth is the only way to go. * Formation chance through 48 hours…high…near 100 percent. * Formation chance through 5 days…high…near 100 percent. Looking like we will have a named storm at 11…Say hello to “Irma”. Understanding Climate Change…with updated video of the effects from Harvey…He also gives us video from around the world of extreme weather events..including the devastating impact of the 2 year drought that continues in Somalia.. WARNING: The last two minutes shows a flash flood event that caught several people unawares..and the deadly consequences. Normal for that location, that time of year. 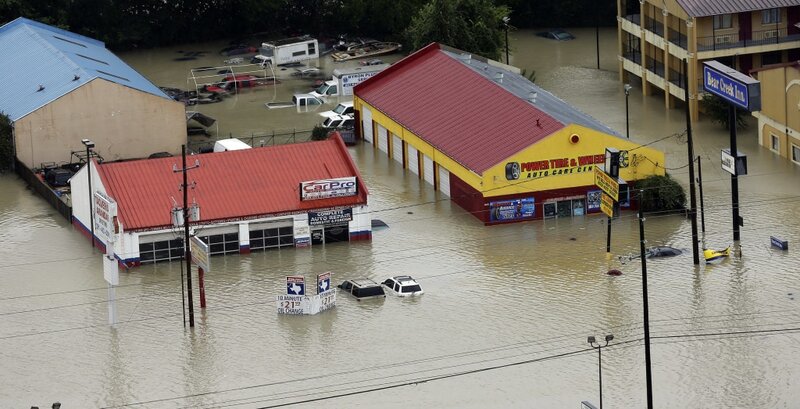 Not exactly climate change-induced flash flooding. Three members of a family were drowned as flash flood caused a sudden flow of water in the famous Patalpani waterfall near Indore. Patalpani waterfall is a famous picnic spot near Indore, and the Rathi family members, who had gone there to enjoy a quiet Sunday, had no inkling of a disaster awaiting them. The water current caught all the five people & three of them Chhavi, Chandrashekhar & Mudita downed dead, while local people rescued Mudita’s brother and another youth. The video was taken by a local tourist Gaurav Patidar. 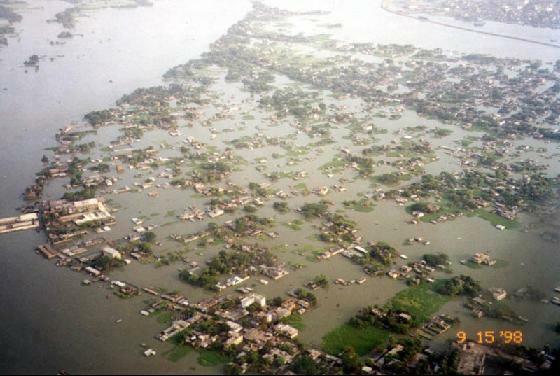 “During monsoon season (July-September), the area is prone to flash floods. On 17 July 2011, heavy rains occurred in the catchment area of the upstream. Over 50 visitors, many of them on a picnic, were sitting near the waterfall at that time. The local villagers warned them about the risk, and asked them to move away from water. Most of the visitors managed to get to safety, but five people did not move away in time. When the water flow started rising, they started to move. However, as they were crossing the stream, they were washed away in a sudden gush of water. Only two of them survived. The bodies of the victims were found over the next week: Chavi Dhoot of 22 years (18 July), Chandrashekhar Rathi of 55 years (19 July) and His daughter Mudita Rathi of 22 years (20 July).